Smith is at the bottom right. Opposite him is John Pedro, the Canadian runner-up for 2012. Original photo by Cardfight USA. Brandon Smith is the former international champion and one of two out of 120 fighters to have qualified in Toronto to participate in the 2012 North American national championship. Originally an Oracle Think Tank cardfighter from outside Canada that later converted to Royal Paladin, he made the leap to Gold Paladin following Barcgal's restriction and used his experience from local play to rocket into the throne of the North American continent. Following this, he became the leading fighter in the world and the first World Champion in history. Smith was also instrumental in the early spearheading of Cardfight in the United States, bringing the game into Collectible Investments in the very first month of its release. 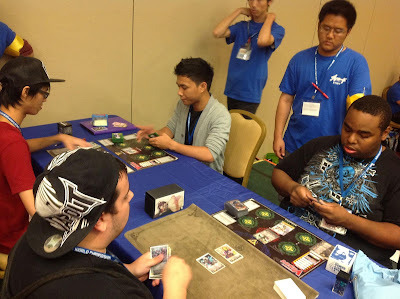 In addition to his victories at Toronto, Los Angeles and Tokyo, Smith participated in the Chicago regional while Brandon Bastianelli used their deck, but was eliminated in the top eight and came in sixth. During the North American Stand Up Challenge Cup, Smith used a Majesty Lord Blaster deck, but abstained from participating past the regional level due to a scheduling conflict with the on-site gunslinger event that he was running at the championship finals. Smith competed using a Great Nature build in the 2013 World Championships, making top 16 at the Toronto regional qualifier and going 12-1 at Chicago; his one loss became the tiebreaker that set him outside the cut to top 8 without the chance to participate further. Despite being denied the opportunity to defend his title, Smith remained positive and continued to encourage others to play Cardfight!! Vanguard. 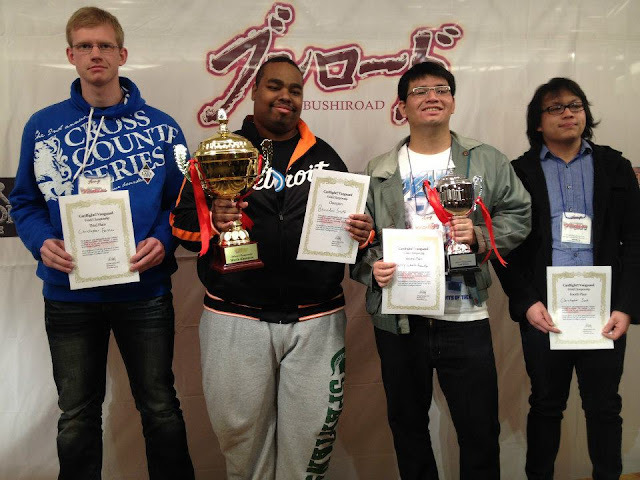 His tenure as world champion ended with the close of the WCS2013 on January 12, 2014, with the title formally passing over to European cardfighter Almeida Stewart. Smith's deck was co-developed between him and Bastianelli, with Bastianelli having developed the early build, later dropping it for the Royals while Smith fine-tuned it. As a result of their diligence, the finished deck would eventually top both the Canadian and Chicago regionals, with no modifications made between appearances. Smith adheres to the Spectral Duke Dragon style of play, using an eight critical, four draw build to try to maximize his output critical, forcing the opponent to race him for damage and activate his limit break more easily. The extra critical triggers also help with Duke Dragon's self-standing skill, as it retains the effects of the triggers upon standing, mitigating the relative lack of threat that it poses upon losing twin drive. Smith chose to use Gwydion over Falcon Knight for his lone draw, most likely because Gwydion's 5000 power can still push Duke Dragon up to 16000 or Gigantech up to 17000. Sleygal Dagger and Little Battler, Tron both work as alternative boosters to one another, Tron turning Duke Dragon into a 21000-power column while Dagger can achieve similar numbers by repeating her counterblast. Due to the popularly questioned integrity of the 2012 championship's double and single elimination format, the most widely agreed upon point about Smith's deck is that its main feature is the ride security. Unlike other cardfighters, Smith's use of the Vortimer ride chain gives him seven extra cards to parse through for his grade 2 and 3 ride, helping to ensure that he does not miss a ride or on his initial twin drive. Smith's Spectral Duke also emphasizes Viviane more commonly than contemporary builds, compensating for the steep loss in advantage that Duke Dragon's powerful limit break confers. His deck is somewhat weakened by the absence of Tripp, as without the ability to unflip damage, any counterblast that Smith uses is permanently lost. This weakens his capacity to survive the latter parts of a match, since without any counterblast the deck's skills are cut off from use, but as it's inherently difficult to survive a well executed Dragon rush, it's rare for the deck to reach that point in the game. This decklist ultimately went unchanged for the national tournament, taking the North American title without modification. Smith's decklist proved extraordinarily long-lived, once again going unmodified for the world title. Smith and Bastianalli were both interviewed six minutes before the Chicago regional award ceremony, by an editor from Cardfight Pro (then operating under the "Game Set" brand.) The full text and an audio recording of the interview can be found here. Smith is second from the left, holding the championship trophy. Original photo by Cardfight!! Vanguard. On the right is runner-up Henry Suharto, to the right of him fourth-place finalist Christopher Sok, and on the far left is third-place finalist Christopher Fernau.